Howdy! Are you enjoying the heat yet? I actually wish we were enjoying it a little more. Colorado is forever on fire in the summer it seems, and I'm not talking about 100º weather, I'm talking smoke and flames! We have been pretty far from the fires so far, but wind carries smoke many miles we have learned. No big deal for many, but Thing One has asthma, so a smokey day means we can't go outside. That gets to be a bummer pretty fast. 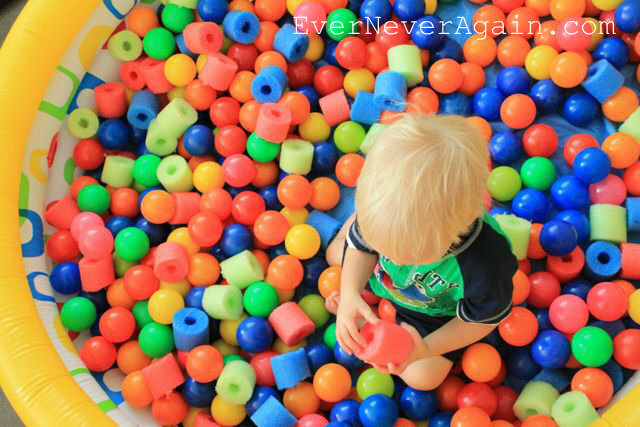 Last week I tried to set up some indoor fun with our at home ball pit! We originally bought the blow-up pool and balls a few years ago. 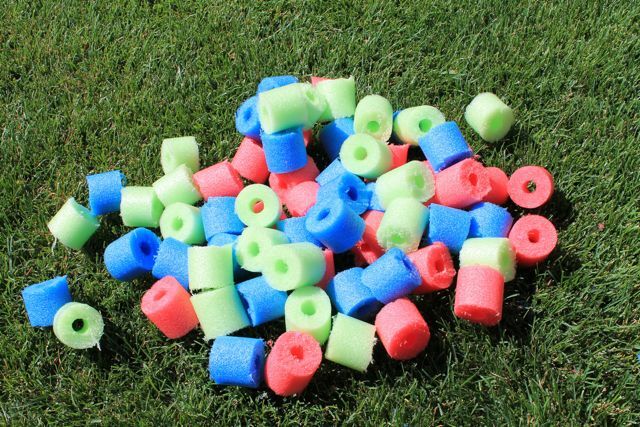 The kids love it, but it takes a lot of balls to fill up the kind of large pool, and I recently discovered a cheaper alternative: pool noodle pieces. Pool noodles are my new favorite craft medium. You can get them at the beloved dollar store. 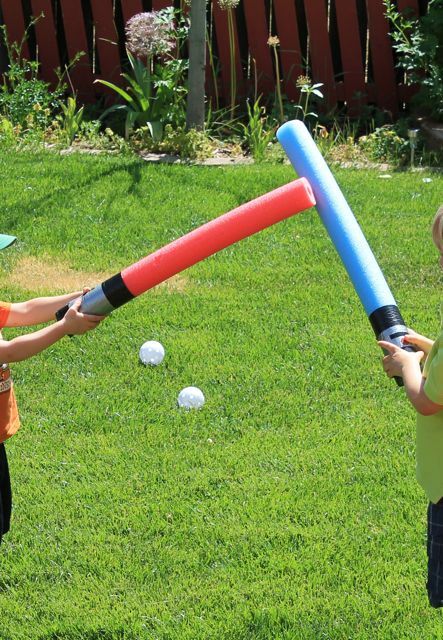 This spring I made the boys light sabers for $0.50 each. Half a pool noodle + black and grey duct tape, and a little piece of red vinyl = hours of fun. Turns out once you start cutting up noodles it's hard to stop, so this week I got out the little handsaw again and cut up a few more to add to the ball pit. Each noodle was about 22, two-inch pieces. 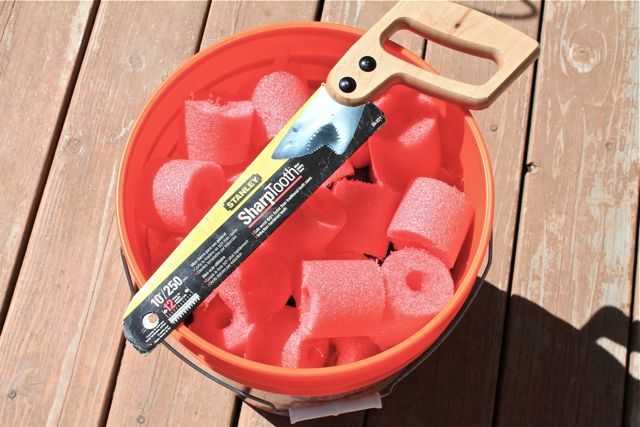 Three noodles cut up filled a five gallon bucket. I figure about 10 noodles would fill a small pool, and 20 a large one. I was kind of sloppy with my cutting, so I had to trim some with scissors after, but if your kids aren't OCD and can keep themselves from picking at jagged edges you might be able to skip that step, lucky you. If you want to buy balls for your "ball pit" you can get them lots of places, we bought ours at Walmart for $10/bag, but it looks like the price is $15/bag now. 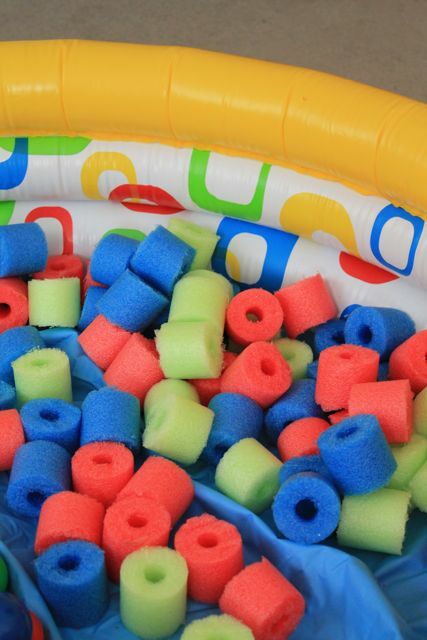 I think you would pay $4 for the same amount if you use dollar store noodles instead, so using all noodles would save a lot of money, since you could fill the whole pool for $10-$20. Or, you can do a combo like we did. I think Thing Two especially likes the variety of textures. To me this project is totally worth the money, for the same price as a day at a water park we have something the boys can enjoy on days it's too hot (or smokey) to play outside in the summer and something fun when we are stuck inside in the winter. Hope you are having fun and staying cool! Thanks for reading! I bet that was a fun sensory experience! Thanks for sharing at Mom's Library! Featured you this week on Mom's Library! HI! I'd like to possibly include this on Inhabitots.com. Can you email me at kellyjoyladd.com for approval? Perfect and affordable idea!! Will be doing this for my son's 1st bday party! How large was your pool? Big enough for 2-3 babies (1-2yr olds)? Yes, our pool was actually big enough for 3-4 kids to sit in it or definitely 2-3 with room to splash. We did a combo of plastic balls and pool noodle pieces. If you cut at least some of the pieces a little bit longer you can also turn them into mini boats later when you maybe don't want a noodle pit anymore. 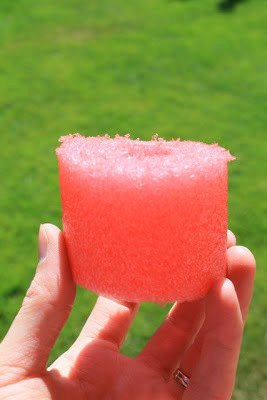 (see that here: http://everneveragain.blogspot.com/2015/06/mini-float-boats.html). Good luck!